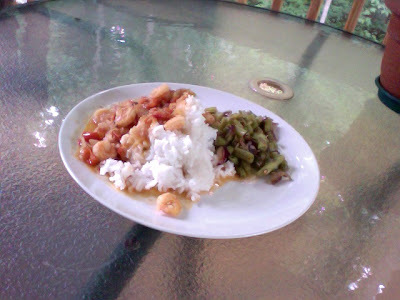 Chow and Chatter: Green Beans with a Kick! saute for a further 5 minutes and its done. It is also great with coconut in it. 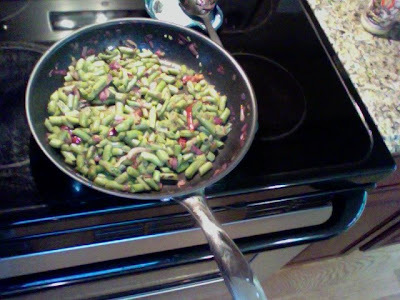 Green beans are in season now and I got some lovely fresh ones in my farm box yesterday interesting they are taken off the plant while the beans are still immature and are one of the few beans eaten fresh. They are packed with nutrients especially vitamin K, vitamin C, vitamin A and fiber. Indeed, beens with a lovely kick! Love the added kick. I love to eat green beans. Looks really good. I've got to try the coconut milk trick. Gosh Reb-how do you find the time to do SO many posts in a day. I keep missing out and have to search the entire blog for the one's I've missed!! You know you can also save some of the posts as drafts,and post them on days you are busy. You list curry leaves in the recipe but not in the ingredients...how many and how do you buy these? I have never seen them! Thanks for the info on the curry leaves! Good weekend!! would never thought about green beans THIS way! thanks! Your beans look delicious--love the added kick. Adding the coconut milk sounds good too. Deb: nice to spice things up a wee bit! Great flavors in those beans!!! These look so yummy!! Fresh green beans are the best!